Halloween Poll: What's Your Favorite Part of Halloween? I love, love, love Halloween! It’s not really the candy that gets me (I try to stay away from getting too much of a sugar-high, although I do have some of my faves—all good things in moderation! ), rather it’s the silliness of the entire premise of the holiday. I mean, really. One day where you get to dress up as something totally random and act like a goof? It’s like being a kid again! And you know how I feel about that. 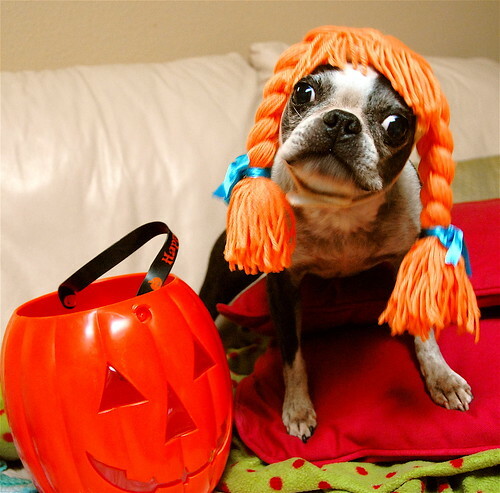 And if dressing myself up wasn’t fun enough, dog costumes alone—in real or emailed-photo form—bring me enough delight to squeal louder than a horror flick. And then there’s the roasted pumpkin seeds…and The Rocky Horror Picture Show. Oh, so much to love. What do you guys enjoy most about this holiday? Can’t see the poll? Click here to tell us about your favorite part of Halloween! I love the decorating and even have orange and purple lights. I see some here in Cali put up Halloween lights and soon after, Xmas lights, so just getting in the spirit. A few years ago I sent away for every free Halloween movie DVD offer on the All Bran cereal boxes and have quite the collection of freebie scary movies. I’m so proud of those and watch at least one every Halloween. This weekend will be “When Good Ghouls Go Bad” with Christoper Lloyd. Happy Halloween! It’s all about the pumpkin for me; Pumpkin bread (pumpkin beer bread! ), pumpkin salad, pumpkin lasagna, pumpkin soup (with apple and slivered almonds).